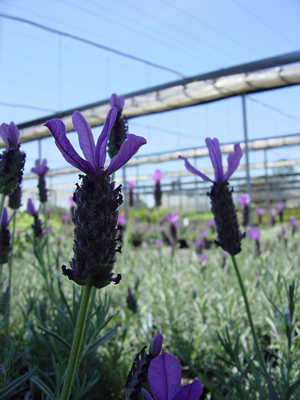 Spanish lavender has dark purple bracts topped with a ‘butterfly’ of lighter lavender bracts. Lavandula stoechas ‘Otto Quast’ is a longer stalked version of Spanish Lavender with even more showy bracts than the original. This selection has silver gray mounding foliage that reaches a height of 28” at maturity. This beautiful lavender will grow well in fertile sandy soil that drains well, and is drought tolerant when established.